Delightful thick spinach curry cooked in a variety of fresh broiled and pounded Indian spices prepared with choice of veggie. 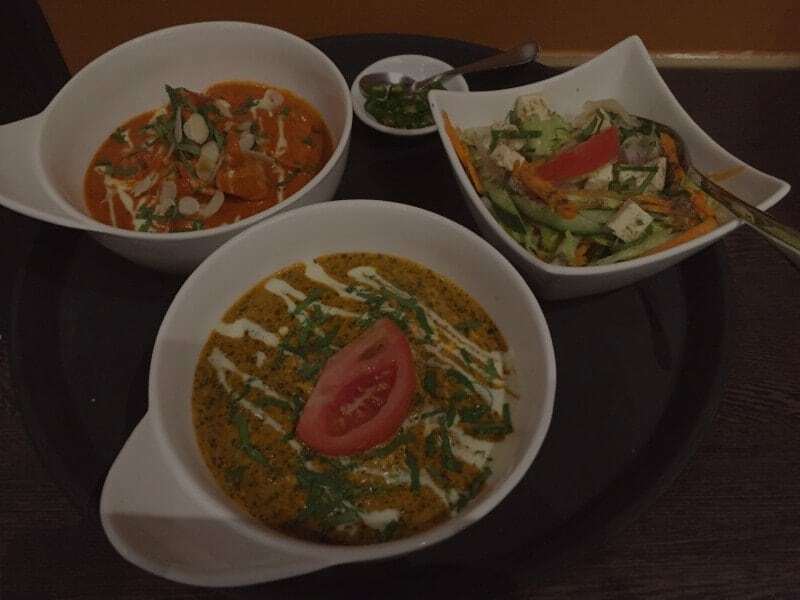 Mushrooms prepared in onion and tomato based curry, seasoned with traditional garam masala and garnished with golden brown onions. Cottage cheese dumplings stuffed with nuts, prepared in a rich addictive cashew gravy. Freshly seasoned vegetables, cooked in variety of spices, garnished with coriander. Chickpea cooked with a mixture of tomatoes, onion and popular Indian spices, served in a thick curry. Designed to melt in mouth, cottage cheese pieces, prepared in a yoghurt rich creamy cashew gravy with herbs & spices. This dish serves potato and peas, stir-fried with onions and ginger, carefully simmered in a spicy tomato rich gravy, garnished with coriander, topped with layer of cream. Seasoned fresh vegetables, cooked gently in a cashew based gravy. Spicy mouth-watering combination of cottage cheese cubes with capsicum, tomatoes, onion & seasoned with freshly pounded kadahi spices. (Kadahi Masala – Fennel seeds (saunf) + Whole Red Chillies and Coriander Seeds). Grilled pieces of cottage cheese, cooked in a tomato based gravy of selective spices, topped with layer of cream, garnished with coriander. Most commonly ordered, smooth textured dish of black lentils and kidney beans, prepared with spices & herbs, with layer of cream to optimise the flavour. Regular featured in many Indian households,yellow split lentils are cooked in traditional indian spices, flavoured with herbs, garnished with coriander. Patato cooked and simmered with cauliflower curry. Eggplant cooked with potato in a diced onion and tomato curry. Combination of fenugreek leaves and cottage cheese cooked in creamy textured gravy. Delicious cottage cheese cooked in rich tomato curry. Deep fried dumplings cooked in a tangy sauce garnished with spring onion served in a curry. Mixed Vegetables and cottage cheese cooked with chopped spinach, methi and spices. Potato cooked with chopped spinach, methi and pounded spices.